As if the East Coast's magnitude 5.8 earthquake wasn't distressing enough, Virginia's got a whole lotta shaking going on. 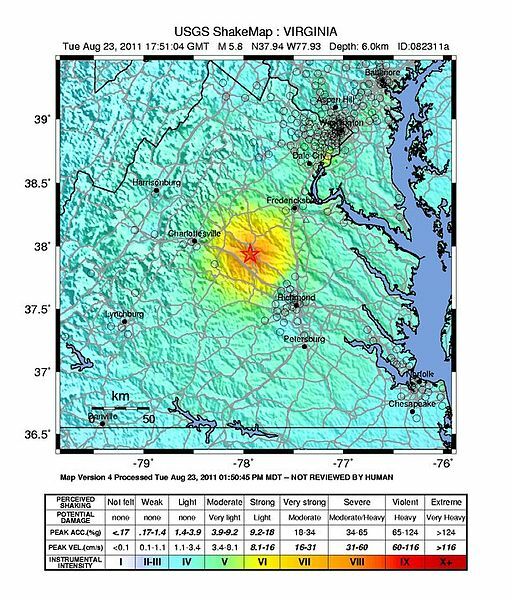 A 4.5 aftershock struck near Richmond early Thursday, the U.S. Geological Survey said on its website. The temblor, which hit at 1:07 a.m. Eastern time, was centered in the same area as Tuesday's earthquake. The epicenter was about 36 miles northwest of Richmond and about 80 miles southwest of Washington. And that's not the only aftershock: The Geological Survey lists four others since Tuesday's 1:51 p.m. quake: 3.4, 4.2, 2.8 and 2.2. But in the greater scheme of things, that's a remarkably low number of aftershocks, geophysicist Amy Vaughan of the National Earthquake Information Center in Colorado told the Associated Press. Thursday’s earthquake was at a depth of 3 miles below ground — about the same as Tuesday’s quake. A Geological Survey map of the shake zone estimated that the perceived shaking at the epicenter was moderate, with potential damage very light. http://earthquake.usgs.gov/earthquakes/shakemap/global/shake/c0005jg1/ In contrast, Tuesday’s quake was classified as having very strong shaking. 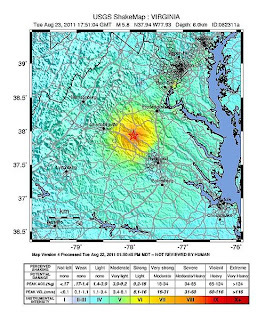 The US Geological Survey (USGS) registered a 4.5-magnitude earthquake in Virginia early Thursday morning, less than two days after a 5.8-magnitude earthquake rattled a wide swath of the eastern US. The USGS said the tremor struck shortly before 1:10am at a depth of 3.1 miles (5km), just south of Cuckoo, Va. -- 36 miles (58km) northwest of Richmond. It was the strongest aftershock registered since Tuesday's major earthquake that forced at least partial evacuations of the US Capitol building and White House in Washington, D.C., as well as the Pentagon in Virginia. Has anyone heard about whether old brick structures like Truro and The Falls Church suffered any damage? As beautiful as those buildings are, they are ill-designed to take a lot of seismic shaking. The structural damage around here seems to heavily focus on chimneys and brick walls. I have not heard of any damage, Scout. I heard yesterday that Gadsby's Tavern in Old Town, Alexandria was badly damaged. This is another brick building that dates to the late 18th Century. It was frequented by Washington and others among his contemporaries. My daughter frequently has performed there as part of an 18th century music ensemble.